The tap guides start every hole straight and helps prevent tap breakage! All the guides have a "v-groove" on the bottom to allow you to work on corners or round surfaces. Each guide is heat treated for durability, allowing a tight tolerance. The guides work great on corners, round and flat surfaces.100% American made quality and a Lifetime Warranty on every guide! 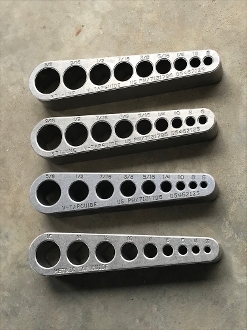 Set includes: one Standard V-TapGuide®, one Metric V-TapGuide®, one STI-UNC V-TapGuide® (coarse threads) and one STI-UNF V-TapGuide® (fine threads). 13 Metric Ground Tap Sizes: 1.6, 2, 2.5, 3, 3.5, 4, 5, 6, 8, 10, 12, 14, 16mm. 10 Unified Coarse Thread sizes: 9/16-12, 1/2-13, 7/16-14, 3/8-16, 5/6-18, 1/4-20, 12/24, 10-24, 8-32, 6-32". This guide is for Screw Thread Insert (STI) type ground taps. Used mostly for thread repair jobs. This guide is for Heli-coil® type ground coarse thread taps.